You’d be forgiven for thinking Peter Crouch had retired! The 38-year-old, now host of one of the country’s biggest podcasts, still plies his trade at Stoke – but is on the cusp of a swap-deal with Burnley’s Sam Vokes! Crouch heading to Burnley for his medical and to finalise personal terms. Hope the M6 and M65 are well gritted! Crouch makeweight in a deal which sees Sam Vokes head to Stoke for £7m. Burnley will be Crouch’s 9th club in his 21-year pro career. 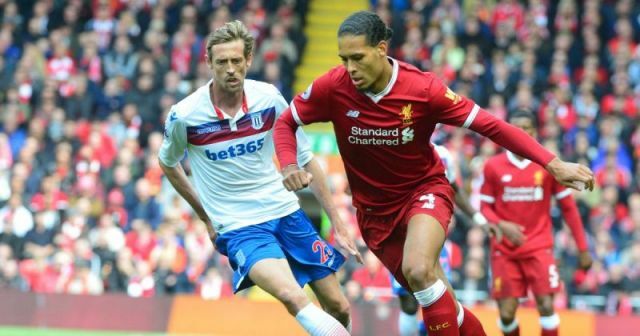 Crouch has just eight goals in his past two seasons, and only two this term despite playing 23 Championship games – so it’s some promotion to a get a Premier League gig again. The likeable forward peaked at Liverpool between 2005 and 2008, scoring 42 goals for us in total – including a memorable perfect hat-trick versus Arsenal. He went on to play for Portsmouth, Spurs and Stoke, with Burnley set to be the 9th club of his career. If there was a manager who suits Crouch’s style more than Sean Dyche, we haven’t see him – so we reckon the 6ft.7′ forward might enjoy somewhat of a swansong!